Taylor Dow was shown at a young age the struggles of others and what it's like to be in need. Since then, the St. Helens High School junior has spent her teen years answering the call for help. Taylor, 16, is serving her second year as class president at SHHS — a role she was voted into twice — in addition to serving as vice president of her school's National Honor Society. She also volunteers with the Lion crew, a team of peers that helps familiarize incoming freshmen with their new school. 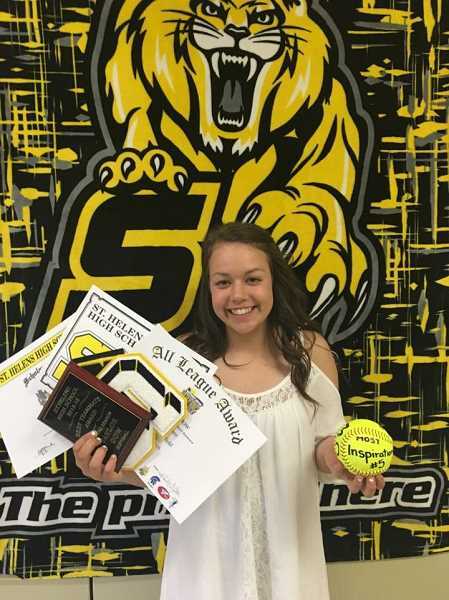 And she lends her time to two annual blood drives, plays on a school softball team, coaches young softball players, and maintains a part-time job at a bakery, all while keeping a 4.0 GPA. Taylor's plate is full, but that never stops her from trying to help those with an empty cup. The St. Helens teen got her first taste of philanthropy as a child. When she was about 8 years old, her mother took Taylor and her older brother, Drake, to an area where homeless people gathered in Portland. It was a deliberate attempt to show her children the reality of everyday life for some. "It was when the weather was kind of bad," Taylor recalls. "We went to downtown Portland and took them blankets, hats and snow clothes. I was very young at the time but it was a very emotional experience. I had never experienced what it was like to not have everything I needed." The experience set the tone for Taylor, who now volunteers in one capacity or another each week. It's become second nature for her. A few years after handing out comfort items to the homeless, she found herself ringing a bell for donations on behalf of the Salvation Army. Later, she teamed up with family members to donate blankets, meals and other care items to sick children and their families at Randall Children's Hospital in Portland. Taylor recalls visiting the hospital, where her 4-year-old cousin, Diamond, was admitted for meningitis. Seeing families in need was a catalyst for Taylor and her family to organize a meal preparation project and several rounds of donations. The Dows gathered stuffed animals and homemade blankets, and purchased groceries for families who were spending most of their time at the hospital. "My brother and I have both grown up very, very grateful for everything we have, so to see people who don't have that, just makes me want to ... feel like we were making an impact on someone's life," Taylor says. "I think part of it,too, was seeing how hard it was for [Diamond's family] — but also we saw a lot of families there with sick kids, and they couldn't do much." Taylor also has lended her time to Community Meals, a program put on by First Lutheran Church in St. Helens and Columbia Pacific Food Bank, to help serve meals to people in need and clean up afterward. At 16, Taylor juggles more than many people twice her age. "I definitely feel like I'm kind of always on the go and always busy," she says. "Taylor is a remarkable young woman," says Tonya Arnold, a longtime teacher at St. Helens High School. "Not only has she fostered a sense of togetherness among the members of her class as their president, she works tirelessly for them. She is truly a servant leader of the highest caliber." Cathi Dow, Taylor's mother, says she's tried to show her children the value of selfless acts by "teaching them to volunteer and donate time and give back and trying really hard to show them the other side of life." Those life lessons have paid off. "She's compassionate and well-rounded," Cathi says of her daughter. "She can hunt and fish. She can play football and also be the most beautiful girl at the prom." If anything, the flurry of responsibilities and constant reach for leadership roles are primers for her future goals. Taylor plans to pursue a degree in business management while pursuing other major milestones along the way. "I set personal goals for myself," Taylor says. "I've always told myself that I wanted to play college softball. I always wanted to be a valedictorian. There's just things I've always wanted to do, and I just kind of push for it each day." Why she is amazing: Taylor frequently volunteers her time for charitable causes. She serves in leadership roles at school and guides young girls on the softball field.